john4jack (Corvallis, Oregon, United States) on 28 November 2009 in Transportation and Portfolio. Narrow gauge railroads are few and far between. I thought about putting this up in B&W but ultimately felt that color was a better choice. All the subtleties of rust...glad you chose color. This is a fabulous one-of-a-kind macro. Sublime! @P J W Miller: Thanks. Très beaux détails! Superbe image! So nicely done jack ! I agree to your choice. Nice expression of rusty colors. Textures, colours and light are superb ! A great photograph and which I like much, bravo! Wow, excellent detail and composition. 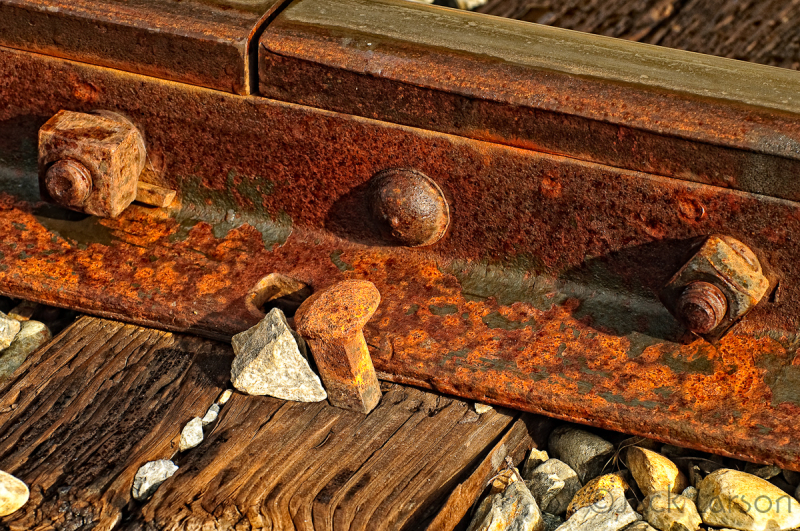 I like this close up of the railroad with the heavy rust. B&W would be a very different image. I like this one in color to get the full effect of the rust. Nice one. @Slackwater - don: Thanks, Don. Great shot Jack....love the textures that appear.....and I had to look up, and learn "what's a narrow gauge railway?" !!!! @MARIANA: Some people like the woo-woo effect. The only way blurry close-ups work for me is when I am creating a selective focus where I only want part of the image to be tack sharp. But something damn well better be sharp!! Oh yes...the gorgeous rich rust colour is stunning. A lovely clear close up shot..I love it when I see a shot on aminus which I would never have thought of myself ..and this is one of them.. just excellent. @MrsAmber: Being out there all day, Kate, tends to force a little creativity, if only to relieve the boredom. Very rich in color - good choice for this shot IMO. @Judy: Thanks. In B&W, it's kind of blah. Yup, your double processing really lifts the colour and textures! Love the colors. Glad that you didn't do it in b&w. @Marion: Like I mentioned in an earlier response, it was blah in monochrome. @bekkah: Thank you. I love B&W, but some things just seem better in color. WOW!! Fantastic capture. I'm glad you kept this in colour. Great textures and tones. I love the llighting. Great composition, color and detail. @Bill Laing: Thanks, Bill. Are you back from the Coast? If so, how was it? Excellent close-up! I adore rust! color looks great to me, maybe b&w too? Amazing vividness of the rust of time on a steel that has been support tonnes of load for years. Rust can be so beautiful at times! Great presentation! it would certainly work well in either -- but i love these rich orange rust tones! @dj.tigersprout: I tried the B&W and it looked blah to me. Excellent framing... details, light and textures are superb. Love all that rust - would have gotten lost in b&w. Color is the perfect choice. @Toni: I tried a monochrome conversion to see what it would look like. It didn't cut it. I do like the color. Really brings out the texture. my favorite colors! your photos are a treat!